Update: For more up to date info, please visit http://altered-time.com/forum/index.php - I will no longer be maintaining this thread. Send me a PM on Altered Time for any individual assistance. Disclaimer: Much of this guide covers technique and highlights key playstyle differences to promote success in raid boss encounters. At some points there may be conflict with simcraft or the experience of others. Please be aware that 5.4 frost is complex with no clear answers only best practices. If you disagree with something in this guide please respectfully post a reply but do not attempt to argue A is better than B. 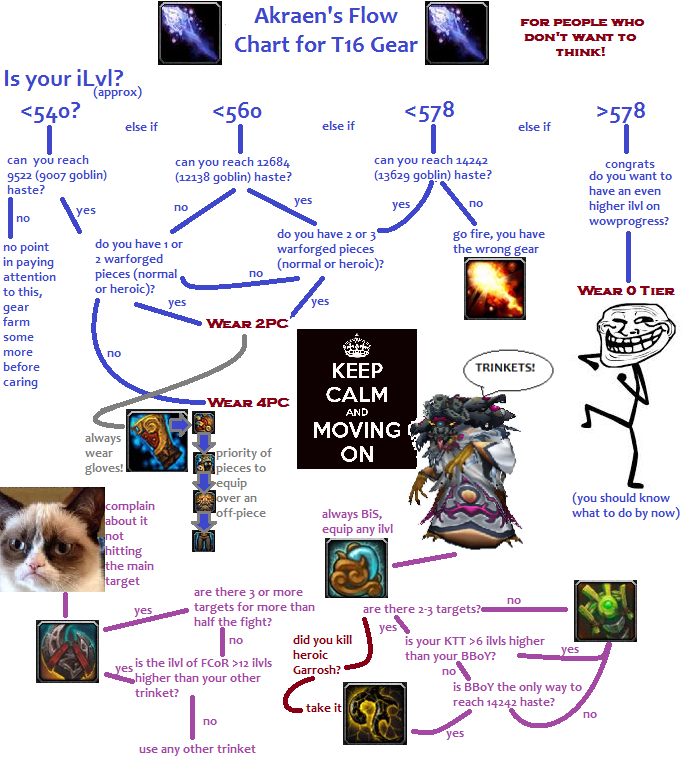 This more or less concludes my 5.4 Frost guide. It's a constant work in progress. So please do not hold it against me for any fuzzy wording or confusing gist. I've attempted to be very clear here with the goal being providing some data and interpretative analysis for mages who consider themselves a little more advanced. This guide will probably not help anyone who can't already maintain bomb uptimes, track their buffs, or those who don't understand that icicles shoot automatically. If all you wanted was a tldr: Haste to 14242, rest in mastery, use PBoI and KTT. Read through it, made sense and can follow it, graphs are extremely nice as well. Good guide Akraen, hopefully it can better answer some people's questions and not spawn frothing-at-the-mouth debate over haste/mastery. Akraen, I think you have significantly obfuscated your haste scaling description. It is misleading to describe haste as scaling itself. All you've described is that (1+x)*(1+y) = 1 + x + y + x*y. In other words, you're observing that proc sources of % haste are casting speed multipliers, just as gear-based haste is a casting speed multiplier. I simply view these non-haste-rating sources of casting speed multiplier as entirely separate factors to consider, and I think it would be clearer if you confined your discussion to whether haste rating scales itself (which it doesn't). Each additional point of haste rating yields a larger gain when a buff/proc is layered on top of it. Each point of haste rating yields a progressive gain as the more haste you have, the more haste you get. I think I was pretty clear about that but if you can point out specifically where that is confusing I will reword it. I just flew quickly over the guide (blackfuse progress), but where is all the waste? DPET clac made without haste procs? Not sure I understand your questions. DPET calcs for single target are in their respective sections. This illustrates mastery's advantage for icicle generators because the burst haste procs waste less. While that is true, DPET gains of bombs increase substantially which explains what many of us have seen: haste works great on cleave/AoE because of less icicle generation time. Please, I am begging though, don't turn this thread into "frost should be ..." or "blizz should change this..." - this is a guide for what currently is here, an explanation for how things currently work, a place to answer questions frost mages currently have. There was no single word about "Frost should be..." or "Blizz should change this...". Your DPET Calc for CoC or Fire Blast for example: With Meta Gem and Lust, the stat waste (haste) with a haste build is way higher than with a mastery build. This is something I factor in. You only reach a DPET ceiling with the full haste build on frostbolt, the shades of green clearly show that in the Haste Build. Frostfire bolt from Brain Freeze doesn't reach the DPET ceiling (thus less waste) because more haste = more procs. You do have a wasted "gain" because it doesn't jump as high as mastery. That's what the chart is made to illustrate. Each of these charts help illustrate visually how icicle generators compete with bombs. This is because one stat scales one, but not the other; and vice versa. Last edited by Akraen; 2013-10-06 at 08:28 PM. I'm trying to point out that this multiplicative behavior is not unique to haste; the only reason you can say "haste scales itself" is because we typically call haste rating and haste procs both "haste". If we called haste rating "haste" and the outside procs "casting speed procs", you would not be able to say this, even though they both affect overall time needed to execute actions. As far as scaling goes, they are entirely separate phenomena. There is no cap for haste. You want as much as possible because it scales with itself. The only way I expect an average person to read that is having to do with haste rating. It's the only thing a person can control with their routine gearing decisions. Furthermore, the relative value of haste (which is particularly relevant for deciding to gear haste rating vs. other ratings) does not change nearly as strongly as the absolute value (which is what you're speaking of). * I would say the relative value of haste doesn't change at all, but that would only be true in a toy model of dps, and with all the concerns over GCD capping, DoT-haste mechanics, and so on, I can't say that with certainty. But I'm very confident that the relative value of haste rating is rather insensitive to all these casting speed procs, and relative values are fundamental to choosing between stats. In short, the whole way you've presented haste rating scaling with respect to casting speed multiplier procs makes it sound as if we get "free stats" or better scaling than we should otherwise expect. I'm not at all convinced this is the case. The multiplicative rules for haste rating interaction with casting speed procs are entirely typical and expected. Further, I believe the relative increase in DPS from haste rating is dominated by the first-order contribution, which is just haste rating % / (100% + haste rating %) and is insensitive to casting speed procs. I do not think this "free scaling" is making any significant contribution to the relative value of haste rating. I do not think there is anything free about it. Of course DPET has no real ceiling. 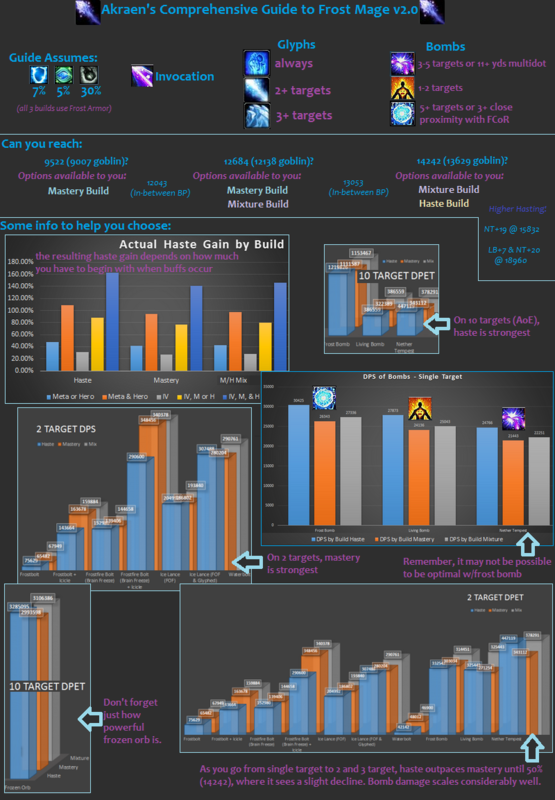 The haste build has highest DPET, because its the only build that reach 50% haste, therefore highest DPET. This is correct. But I´m sure you know, that the haste build is wasting haste the most with haste procs? This is something I factor in by making my reforge plan (preperation). Last edited by mmocc7076034c2; 2013-10-06 at 08:34 PM. Convinced or not, these are the results. The numbers are there, what more do you want? You gain more haste the more you have. If there were buffs that gave you %mastery then the same would be true, but there are not. Haste is the only stat that gets burst percentage gains. So this is not a phenomena, this is a real-world analysis of the relative gain from that scenario. You can think whatever you want, but go pop Time Warp in-game with 6000 haste rating, then pop it again with 12000 haste rating. You'll see the difference. I'd also like to caution you about proclaiming I'm being unfair with haste here. It feels as though some people might not notice the other 2 sections here. I think I'll put "Haste Build" last - because I think some are misreading the intent of the post. All that said, I agree that my wording could be more clear so I'll clarify that. And the information presented with the min/max haste, min/max mastery and mixture lists should help you as well. The current design basically means you'd reforge and regem for every.single.encounter. That's a lot of work. Please remember these numbers are not opinions. I verified them with Lhivera's information and that is why this guide is advanced. In order to make use of this information you should understand what DPET is, and why mastery and haste do not play well together. The more time you spend nuking, the better mastery is, the more time you spend using bombs or AoE, the better haste is. It's a tightrope and this guide provides context that can help you balance it. Last edited by Akraen; 2013-10-06 at 08:45 PM. One small correction and calculation that would be nice on your haste build, is that the break point of 18960 is not only a break point for Nether Tempest, but also a break point for Living Bomb as well. Your guide does not indicate this. Also, the additional damage increase for the 18960 break point for Living Bomb is 61.667%, whereas it is only a 52.786% increase for Nether Tempest. With this in mind, assuming you can hit the 18960 break point with the haste build, how does bomb choice and this spec compare to the single target of Mastery at this level of haste with the additional tick and proc increase in living bomb and nether tempest for Brain Freeze generation and it's respective synergy with our 2 set bonus? Great work Akraen, will serve as very good reference material. Especially for people like me who want to give frost a try but waiting for T16 2 piece. You can think whatever you want, but go pop Time Warp in-game with 6000 haste rating, then pop it again with 12000 haste rating. You'll see the difference. Assume 2 sec base interval for some damaging event during your 40 second window of time warp. at 0 haste, you'll get 26 damaging events. Outside of time warp (or any generic +% casting speed cooldown/proc), each 6000 haste rating will only give you 2.82 extra damaging events, so the % casting speed cooldown/proc does make haste rating 30% more effective, but it also makes crit and mastery more effective, because more casts = more crits / more icicles. As a result, this is not an advantage that's unique to haste, and the presence of these +% casting speed procs/cooldowns should be neutral toward the relative value of haste vs. crit vs. mastery. Last edited by Nitwit; 2013-10-06 at 09:23 PM. A build with only 35% haste and tempus repit uptime of 45% only wastes 25.5% for 45% of the time, lacks 15% haste for maximum DPET 55% of the time, but have more of other (e.g. mastery) stats. This is one of our core issues imho. We have a lot of instant casts and we have to care about wasted stats. This is pretty important to me, part of my preperation. This is no criticism, but my point of view. I think you cant compare the one without the other. No, I don't base my calculations on DPET. I show DPET calculations. It's far more useful for me to display facts then continue to just give my opinion as others do, and hope people listen to me. You can easily say we waste haste with our instant spells. I can just as easily say every GCD spent on anything other than frostbolt or brain freeze is a waste of mastery. What you're saying is correct, and I have agreed to that point multiple times. You continue to question me as though I do not agree with this. I do, however, insist that you are able to make up for wasted haste with bomb usage. DPET and DPS gains on bombs, including Living Bomb, helps haste make up for the deficiency particularly in 2+ target situations. If you are so sure of your stance that it is never worth it to go beyond x% haste, then please post justification beyond your simple opinion. So I am going to say one final time: The information in the calculations are correct. You get to interpret the information to make decisions based off which build to go for which fight you are currently progressing on. If this idea is too complicated for you, please stay away from this thread or focus on the Mixture build. These numbers are not wrong, they have been verified and re-verified. I am trying not to give up on the mage community here and am trying to provide actual information for people to answer questions that I am asked by dozens of people each day. Aha! I knew I missed a line somewhere. That is very correct. Once you reach 18960 Living Bomb is definitely a sizable DPS increase over NT on single target and would be my choice of bomb on Iron Juggernaut and Thok. I'll update this for clarity immediately. Thanks! Last edited by Akraen; 2013-10-06 at 09:53 PM. Calculating DPET is not really complicated Akraen and therefore these calculations are not "too complicated" for me. had a wall of text here, but I decided to delete it, because I am at a certain point (I could see it coming) where I just say "I´m out"
Let me be clear: I do not question that the numbers are what the numbers are, but I think you're presenting them with a conclusion about what they mean that does not correspond to reality or their actual significance. You may gain more haste the more haste you already have when a casting speed proc occurs, but I don't believe you gain much more DPS, by percentage, in one scenario over another. Let me illustrate in a napkin math scenario. Casting rotation consists of one 10-second channeled spell that scales with haste, dealing 1000 damage over that period for 100 DPS. Case 1: 35% haste. 135 DPS. Add 30% meta proc. Total casting speed multiplier is 1.35*1.3 = 1.755. Total DPS is 175.5. % DPS increase is, 175.5/135 = 1.3, or +30%. Not a surprise. Case 2: 45% haste. 145 DPS. Add 30% meta proc. Total casting speed xplier is 1.885. DPS is 188.5. % DPS increase is 188.5/145 = 1.3 (+30%). Begin with 30% meta proc. DPS is 130. Case 1: add 35% haste from gear. DPS goes from 130 to 175.5. Increases by 35%. Case 2: add 45% haste from gear. DPS goes from 130 to 188.5. DPS increases by 45%. Looking at just how the haste % changes under these procs is to compare DPS in a current state to a baseline with no haste. That's nonsensical. It doesn't reflect the real choices people face in gearing their toons. These scenarios should convince you that real % DPS increase from a casting speed proc is mostly haste agnostic. I say mostly because I'm well aware that effects not covered in these napkin math cases (DoT-haste mechanics in particular, along with GCD capping) lead to differences in real haste scaling. So while these procs may be "magnifying" your haste, this has very little sigificance toward actual % DPS increases. And that's what we care about, isn't it? DPET is only one piece of puzzle & it'd be misguided to make decisions on gearing / rotation based on DPET alone. The other piece is ability frequency - the DoT bombs are only cast once every ~12s in a single target scenario. 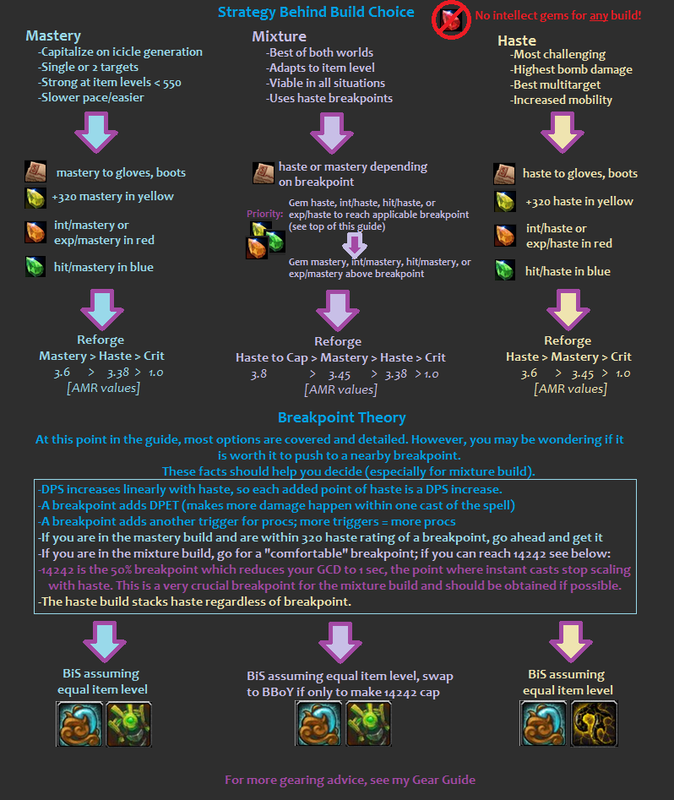 Using the M/H build haste numbers from your chart (1.41s frostbolt cast time, 1.1s global) you can get off approx. 6 frostbolts, 1 ffb, and 1 ice lance between bomb refreshes. So in order for the haste build to be better, you'd have to show that the DPET increase from the bomb outweighs the DPET decrease from 6x frostbolt+icicle, 1xFFB+icicle, and 1x ice lance relative to the M/H build. Of course, increased haste on bombs increases BF proc rate, so to get precise you'd have to go into fractional casts (like the haste build would yield ~1.2x the FFB casts expected per bomb refresh cycle & adjust cast rates of the other spells accordingly). Roughly eyeballing the numbers from the DPET table indicates to me that the M/H build is quite a bit better (single target), especially considering they both get the same number of LB ticks. I'm sorry Muphrid, but you're incorrect. That is not how it works. If you were correct, it means Lhivera is wrong, AMR is wrong, I am wrong, and the Blizzard character sheet is wrong. If you have 45% haste from gear, and add 30% haste, you do not get 1.45*.3 = 88.5% haste, you actually are at 102 haste. Which means you effectively gained 102-86 = 16% more haste by having 10% more haste before the buff happened. DPS does not scale consistently or linearly with haste. You cannot say by adding x% haste you gain y% DPS. Some of our spells do not have a DPS increase as you gain haste. Some spells do, but at a decreasing rate as they approach their GCD (which is the waste Pete was referring to). Conversely, some spells do not scale with mastery, fewer-- actually.